Nerves may be compressed from tight ligaments, inflamed tendons, tumors, fracture fragments, varicose veins, scar tissue or injuries to the foot that cause the foot and ankle to be misshapen (severe flatfoot). Nerve compression may cause significant discomfort with weightbearing. Night pain and pain while the patient is nonweightbearing are common as well. The most important a physician can do is to direct the treatment to the cause of the problem. If the foot is misshapen causing no pain (numbness, tingling or shooting), the nerve does not need surgery, the foot and ankle bones might. The wrong diagnosis can be disastrous. If a tumor or varicose vein is causing the pain they may need to be resected to allow the nerve to function normally. Anything abnormally applying pressure to the nerve may cause symptoms. If a tight ligament is identified, it has to be released to allow the nerve to function normally. Occasionally nerve conduction studies are performed to assess the degree of nerve compression and nerve damage. 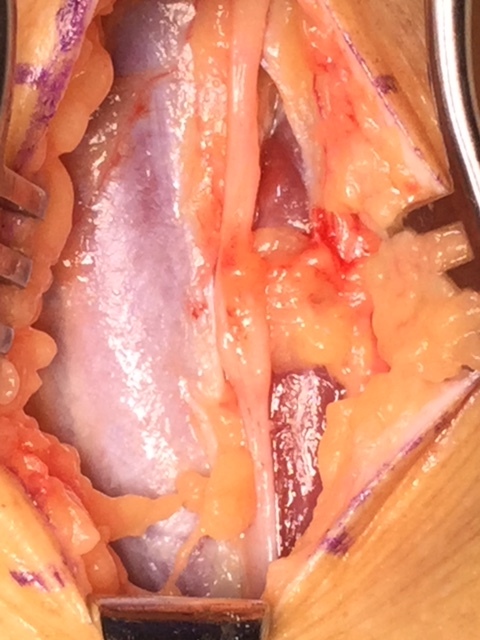 The common peroneal nerve is located at the fibular neck, just to the outside of the knee. If the nerve is injured or damaged, it can cause a dropfoot due to paralysis of the muscles that it innervates. 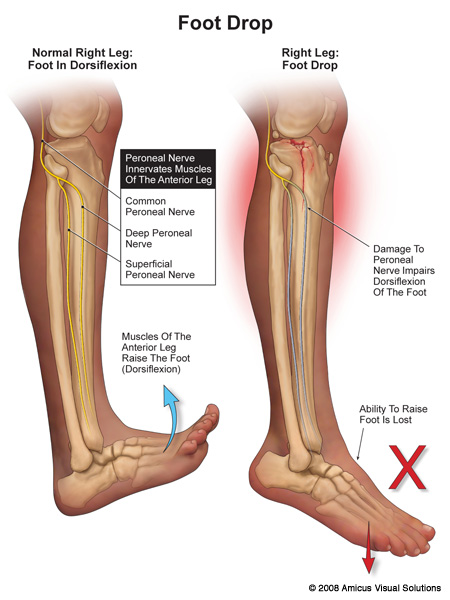 The superficial peroneal nerve exits the deep muscle on the outer portion of the lower leg approximately 4” above the ankle. There are many variations to the nerve anatomy. It runs down the outer part of the leg and splits into two branches. One branch provides sensation to the top and inner portion of the foot. The outer branch goes down the outside of the ankle above the outer ankle ligaments and provides sensation to the top outer third of the foot. 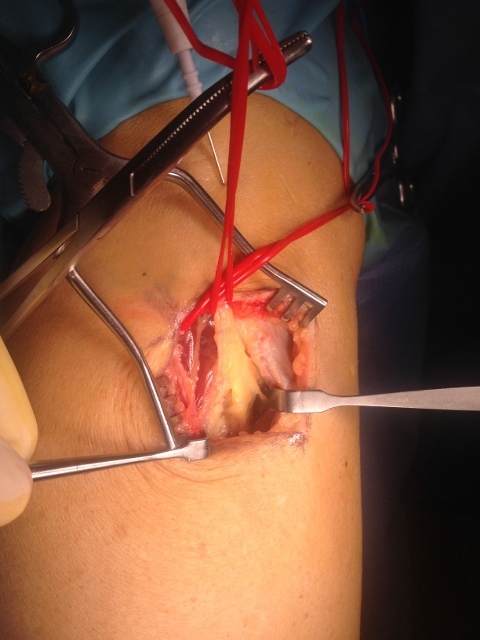 Blunt trauma to the outer portion of the lower leg where the nerve exits the nerve becomes superficial. Ankle sprain causing tethering of the nerve against a tight ligament structure. 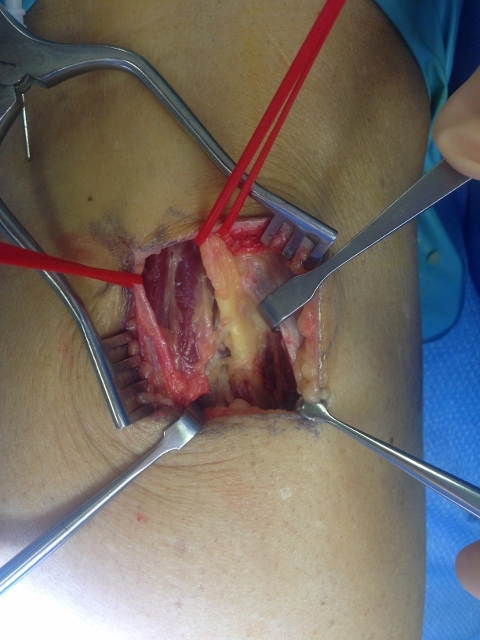 Hernia of muscle on the outer portion of the leg causing nerve compression as the nerve exits it becomes superficial and exits a small hole in the deep fascial tissue. May be associated with lower back pain. 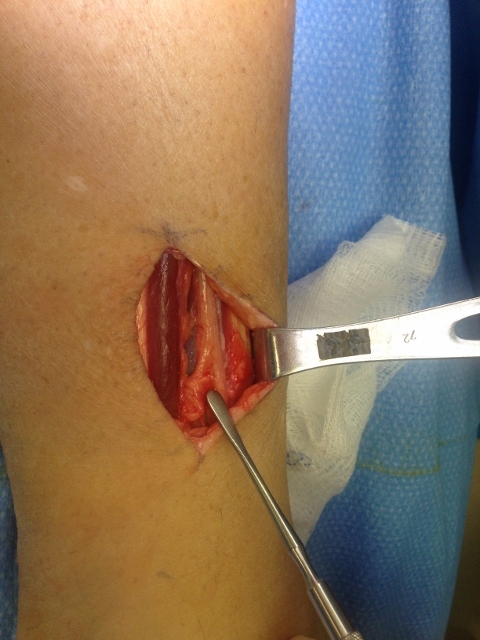 Associated with chronic exertional compartment syndrome. 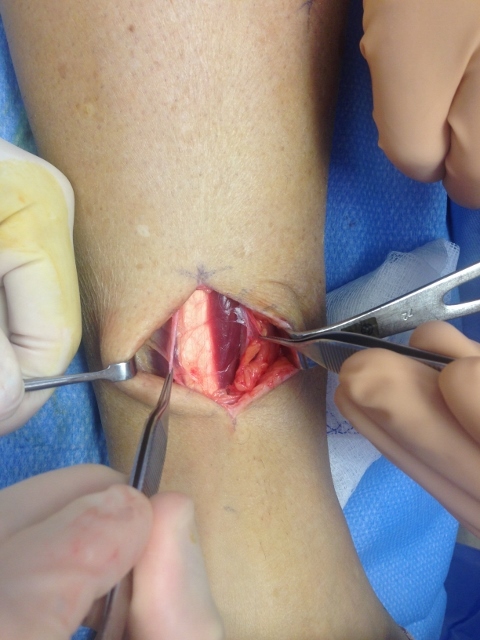 Postoperative complication of ankle fracture surgery. One may see a small hernia of muscle on the outside of the lower leg that enlarges with activity. Burning, numbness, shooting and tingling when gently tapping the nerve in the outer leg. Numbness across the top of the foot. Nerve conduction studies may be necessary to determine the degree of injury to the nerve. It also assists in ruling out lumbosacral root lesions (sciatica) that may be contributing to the problem. MRIs are usually not necessary unless the physician believes that a space occupying lesion may be contributing to the problem. If associated with trauma time will usually help to resolve the patient’s symptoms. If biomechanical abnormalities exist (cavus foot – high arches) orthotics or shoe wedges may help unload the lateral compartment musculature. 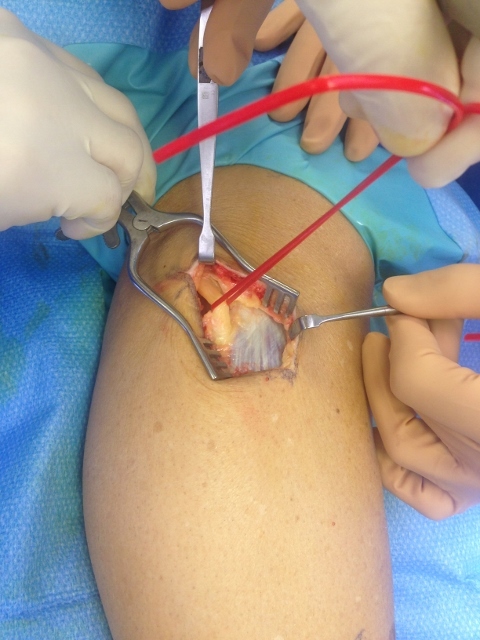 If inflammation around the area is precipitating the pain, localized injection of an anesthetic and cortical steroid may help to reduce the inflammation and deep swelling in the area. 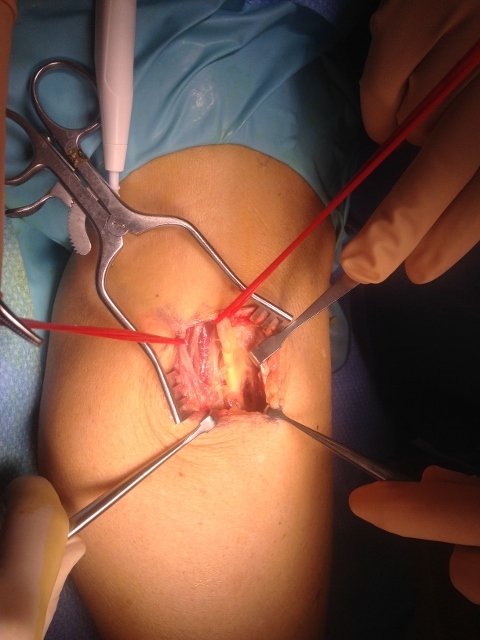 If associated with chronic exertional compartment syndrome the problem will most likely remain, necessitating surgical release of the ligament (fascia) covering the nerve and muscle. Excellent if the nerve is healthy and just compressed. Releasing the ligament that covers the nerve will allow the nerve to function properly and quickly eliminate the pain experienced by this nerve entrapment. 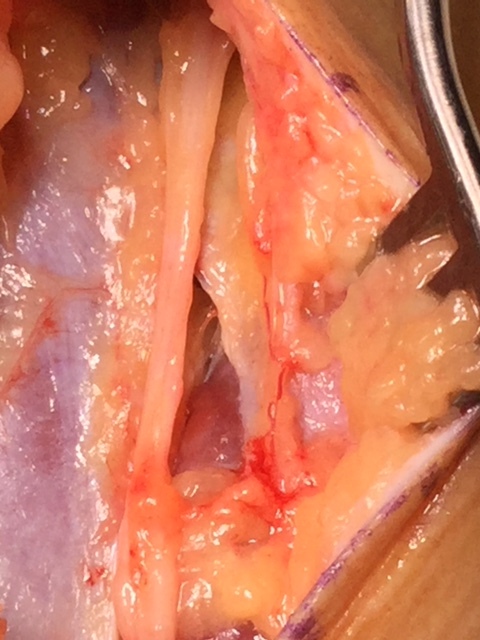 The Fasciotomy is performed (to the right of the nerve, you can see the white fascia that was released and the muscle below). 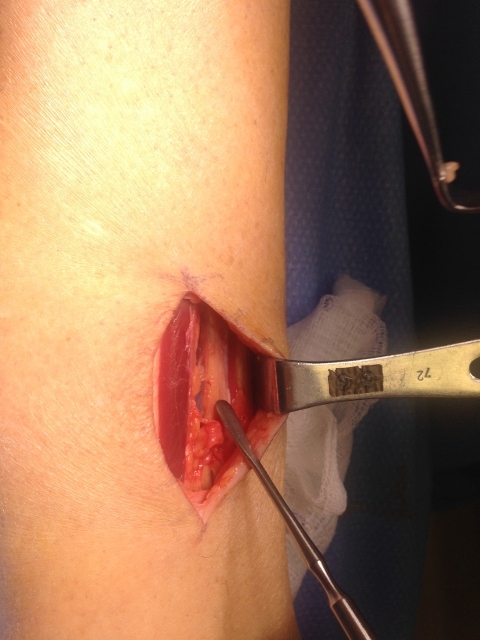 Intraop Pic of Fasciotomy with Release of the Superficial Peroneal Nerve. Nerves may be compressed from tight ligaments, inflamed tendons, tumors, fracture fragments, varicose veins, scar tissue or injuries to the foot that cause the foot and ankle to be misshapen (severe flatfoot). Nerve compression may cause significant discomfort with weightbearing. Night pain and pain while the patient is nonweightbearing are common as well. The most important a physician can do is to direct the treatment to the cause of the problem. If the foot is misshapen causing no pain (numbness, tingling or shooting), the nerve does not need surgery, the foot and ankle bones might. The wrong diagnosis can be disastrous. 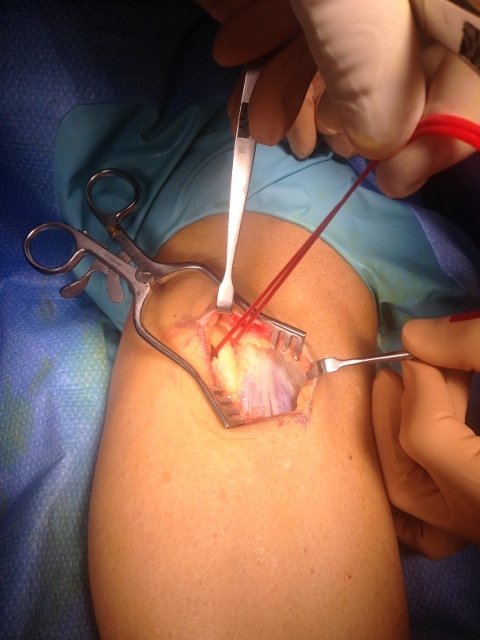 If a tumor or varicose vein is causing the pain they may need to be resected to allow the nerve to function normally. Anything abnormally applying pressure to the nerve may cause symptoms. If a tight ligament is identified, it has to be released to allow the nerve to function normally. Occasionally nerve conduction studies are performed to assess the degree of nerve compression and nerve damage. 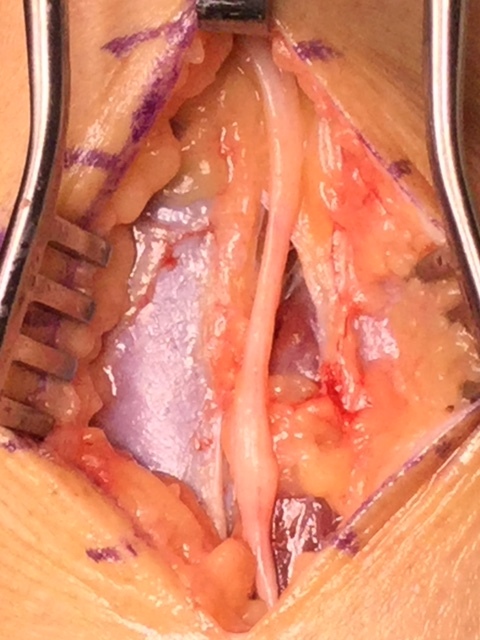 The common peroneal nerve is located at the fibular neck, just to the outside of the knee. If the nerve is injured or damaged, it can cause a dropfoot due to paralysis of the muscles that it innervates. Nerves may be compressed from tight ligaments, inflamed tendons, tumors, fracture fragments, varicose veins, scar tissue or injuries to the foot that cause the foot and ankle to be misshapen (severe flatfoot). Nerve compression may cause significant discomfort with weightbearing. Night pain and pain while the patient is nonweightbearing are common as well. The most important a physician can do is to direct the treatment to the cause of the problem. If the foot is misshapen causing no pain (numbness, tingling or shooting), the nerve does not need surgery, the foot and ankle bones might. The wrong diagnosis can be disastrous. If a tumor or varicose vein is causing the pain they may need to be resected to allow the nerve to function normally. Anything abnormally applying pressure to the nerve may cause symptoms. If a tight ligament is identified, it has to be released to allow the nerve to function normally. Occasionally nerve conduction studies are performed to assess the degree of nerve compression and nerve damage. 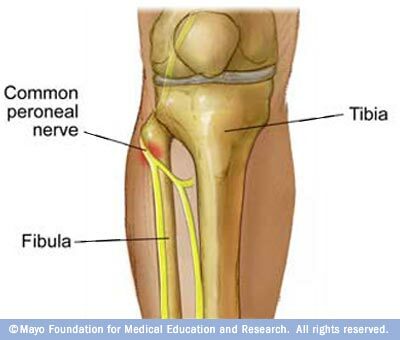 The common peroneal nerve is located at the fibular neck, just to the outside of the knee. 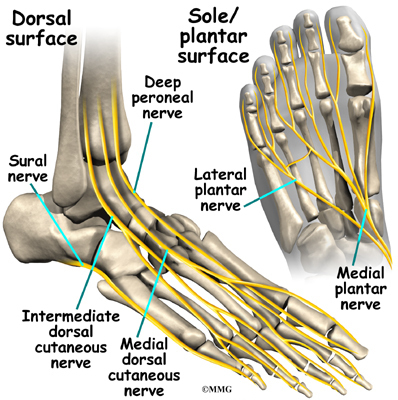 If the nerve is injured or damaged, it can cause a dropfoot due to paralysis of the muscles that it innervates.